Exotic annual Bromus species are widely recognized for their potential to invade, dominate, and alter the structure and function of ecosystems. 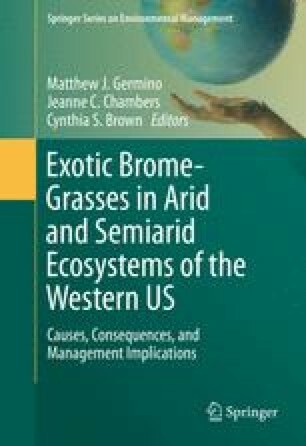 In this chapter, we summarize the invasion potential, ecosystem threats, and management strategies for different Bromus species within each of five ecoregions of the western United States. We characterize invasion potential and threats in terms of ecosystem resistance to Bromus invasion and ecosystem resilience to disturbance with an emphasis on the importance of fire regimes. We also explain how soil temperature and moisture regimes can be linked to patterns of resistance and resilience and provide a conceptual framework that can be used to evaluate the relative potential for invasion and ecological impact of the dominant exotic annual Bromus species in the western United States.